Do you know what is above the famous Giessbach Falls situated at the Lake of Brienz? I don’t! This is why I would like to set off for a discovery hike to explore the area of the Bernese Oberland. The hike starts in the idyllic village Iseltwald, where we embark the boat to the Giessbach Falls. 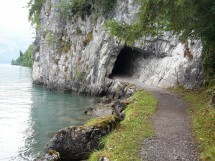 Then we walk up to the “Axalp” and continue on the so called “woodcarving path” to the lake “Hinterburg” where we have lunch. After we return to the Axalp to take the bus back to the Giessbach Falls. At the end of the day we stroll along the wonderful lakeshore of Brienz to get back to Iseltwald. It is a long and challenging hike where we take public transport for some sections in order to do it in a one day. Therefore only sign up when you are fit and used to walking. Please be aware that we can’t wait for latecomers due to the boat and bus departure times. 19:30	End of the day! Suitable hiking clothes, sunscreen, sunglasses/ hat etc. Post a message on the board if you have a place in your car. If you look for a place in a car (act promptly) contact someone for a lift. Note: I am not a guide. You are responsible for your own safety in the mountains. In case of bad weather the hike will be cancelled.